Eggless Malai Cake in cooker reminds me of my childhood. I have lots of memories related to malai cake. My mom used to make this recipe of malai cake in a cooker for me and my sister. That was the time when the oven was a luxury in homes. She used to bake this malai cake without an oven (her old prestige cooker). The other reason this easy Malai cake recipe is close to my heart is that this was the first cake I baked when I was 14. Back then, I never thought that I will be sharing my Mom’s malai cake recipe with you all. Though I have made a few changes, the credit goes to her. We will learn how to make eggless malai cake just in a while. Time doesn’t stop. As we grow, we generally forget many of our childhood friends, food etc. I am not different. 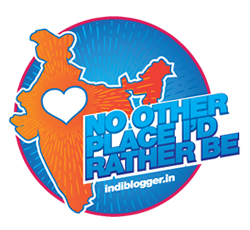 It’s been more than a year I started my blog and started sharing my baking recipes. But until now, did not remember to share my first official baked eggless cake with malai. Last week when I and my son were discussing my childhood, he asked,” Did Nani (my mom) use to bake when you were small, just like now you bake for me?” This question immediately refreshed my childhood memories and this recipe of cake in pressure cooker. I called my mom, checked the recipe with her and baked this malai cake for my son. I couldn’t resist myself from biting it as soon as it was done. Did not wait for it to cool, sliced it and ate. I don’t have a sweet tooth but the aroma of freshly baked eggless Malai cake made me a child again. I bet, this cake will not stay even for a day on your shelf. I have used fresh malai (Fresh cream accumulated from double toned milk) for this malai cake. To start with, in a bowl mix malai, oil, and sugar. Whisk it well until sugar dissolves and you get a smooth paste. Make sure, the malai should be at room temperature. 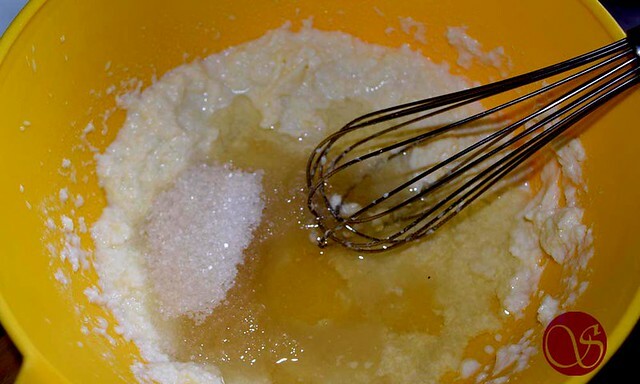 Once sugar dissolves, add semolina, sifted flour, baking powder, baking soda, salt, milk, and vanilla essence. 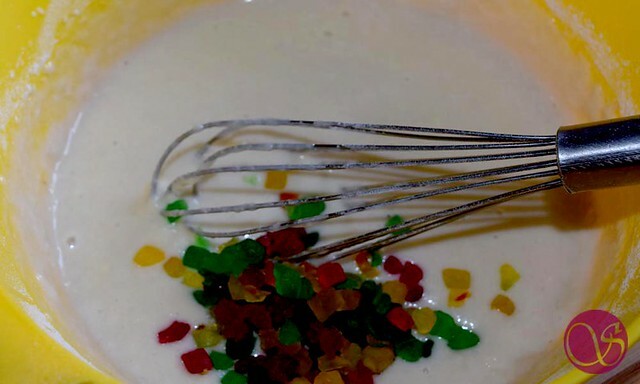 Mix all the ingredients evenly and let this batter rest for 5 minutes. During this resting time, semolina will soak the moisture and become soft. Meanwhile, preheat the oven to 180 °C. Add tutti frutti to the batter and gently fold it. Pour the prepared batter into a greased loaf pan. 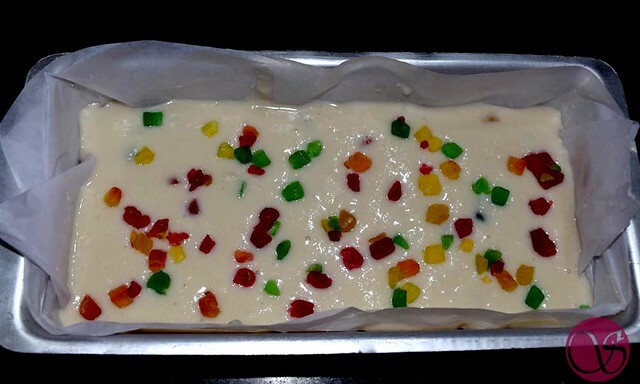 If you want, you can use butter paper as well which will help to de-mould the cake easily after baking. Sprinkle some tutti frutti on top and tap the baking tin on counter to release the air bubbles. Bake this in a preheated oven at 180 °C for 25 minutes or until it passes the toothpick test. Baking time can vary depending on your Oven capacity and model. I have Morphy Richard’s 28 liter Oven. My malai cake was done in 25 minutes. Once baked, take the cake mold out from the oven and let it cool for 5 minutes before de-molding. 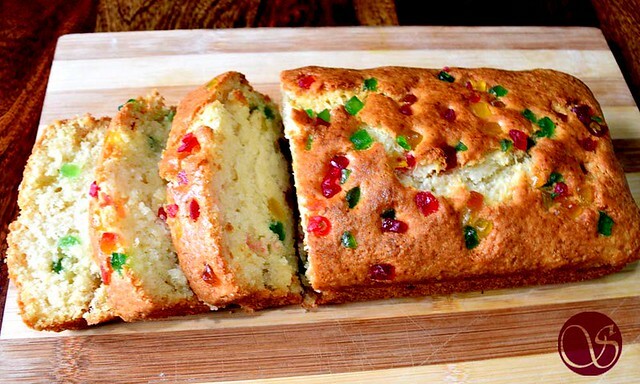 You can bake this cake on the gas stove in a pressure cooker. Put salt in the cooker as a base. Place one stand on it and keep the baking tin on the stand. Close the lid and remove the whistle and gasket. Let it bake on slow to medium flame for 20-25 minutes. You can bake this on MW convection mode at 160 °C for 25 minutes. Delicious, moist, tender and loaded with the richness of malai, the Eggless malai cake is ready. Slice it and serve it with your choice of tea or coffee. I can have it at any time of the day. If you find the recipe easy and liked it, please share your valuable feedback in the comments box. I personally read all the comments and respond to them. Learn how to make a malai cake in a pressure cooker or how to bake a cake in the microwave. 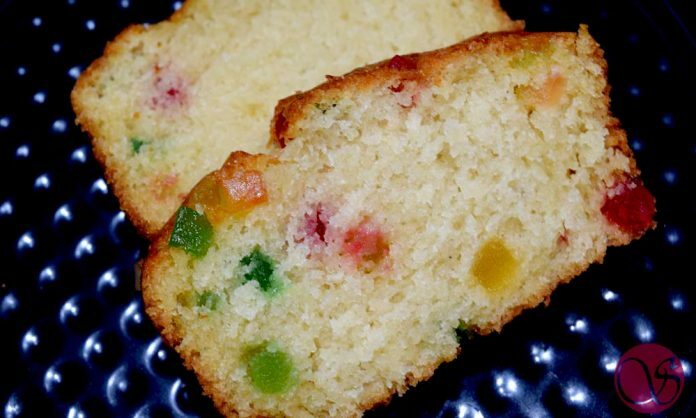 Make this amazing eggless malai cake recipe with home stored cream. The softness of this malai cake will amaze everyone in your family. In a bowl mix malai, oil and sugar. Whisk it well until sugar dissolves and you get a smooth paste. Once sugar dissolves, add semolina, sifted flour, baking powder, baking soda, salt, milk and vanilla essence. Mix all the ingredients. Add tutti frutti to the batter and gently fold it. 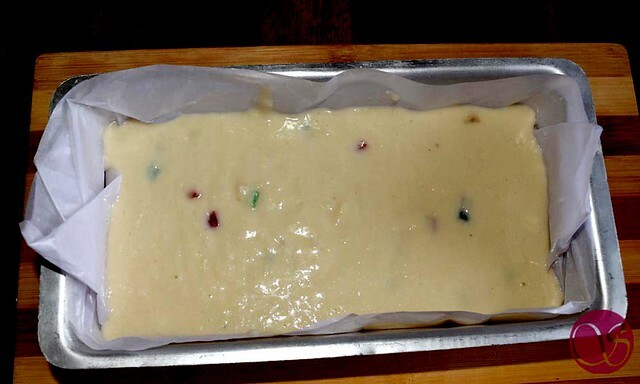 Pour the prepared batter into a greased loaf pan. 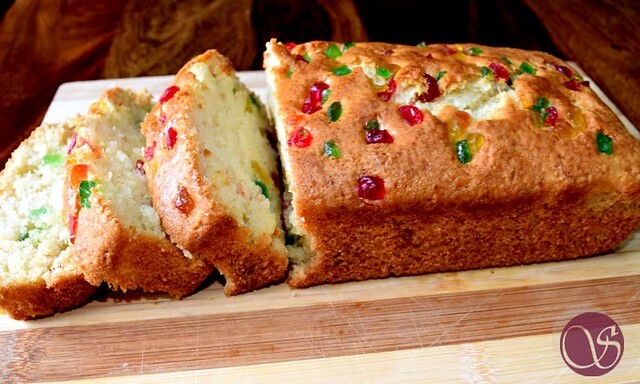 Sprinkle some tuuti frutti on top and tap the baking tin on counter. Bake this in a preheated oven at 180 °C for 25 minutes. 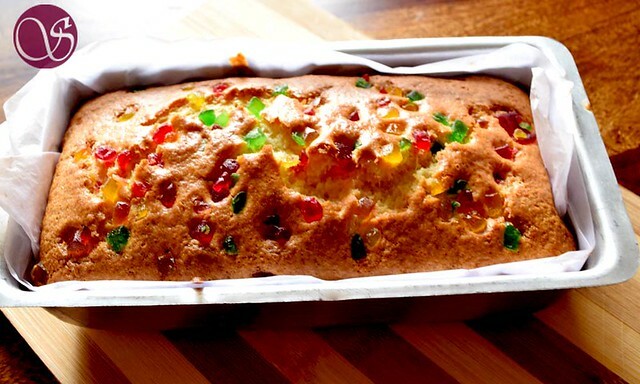 Once baked, take out the cake mould out from the oven and let it cool for 5 minutes before demoulding. Delicious, moist, tender and loaded with richness of malai, Eggless malai cake is ready. If you want to use eggs for this recipe then you can add 1 egg without making any other changed to the ingredients. If you are using Malai from Full Fat Cream Milk, then skip the oil. Do we have to grind the semolina for this recipe? We have used Chiroti Rava, but if you find difficulty in getting Chiroti Rava, you can use regular rava and fine grind it in a mixer. Hello. I baked it without oil. It tasted yum. Definitely this cake tastes better than all maida cake. Thanks a ton for your feedback Sal. I am humbled. I like to know the purpose of using the butter. Really inspired to try this recipe after going through your post. However, I would like to know if I can bake this using wheat flour, if you have ever tried? Yes go ahead and try it with whole wheat. Share your feedback with me. What type of oil should we use.. is that ghee or oil? you can use any unflavoured oil. Thanks for appreciating my work Subashinee. Thanks for connecting. Thanks for liking Malai Cake recipe. Hope you are making it soon. You may like to share the pictures of your malai cake on my FB group https://www.facebook.com/groups/sonlicious. Also, thanks for showing interest in my workshop. My next Mumbai workshop is on 9th June. like my FB Page https://www.facebook.com/sonliciouss and you will get a notification as soon as plan the event. 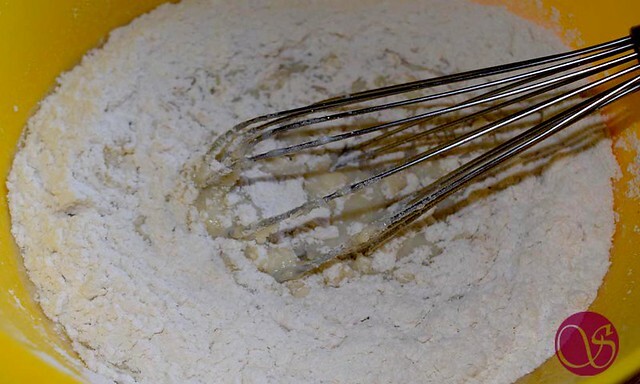 Hi do you recommend using an electric handheld mixer or just simply using a wire whisk and mixing by hand is enough to incorporate air into the batter? Is the texture expected to be light and fluffy or dense? Thanks. – Whether to use an electric handheld mixer or simple wife whisk is an individual choice. The only difference is the amount of effort. – Texture will be dense because of cream. Hi Sneha, If you are using malai from a full fat milk, you can completely skip oil and butter. I tried this eggless cake, turned out so well. Thanks Much for your lovely feedback. I tried this cake, turned out so well.. Yes, you may use APF instead of Rava. 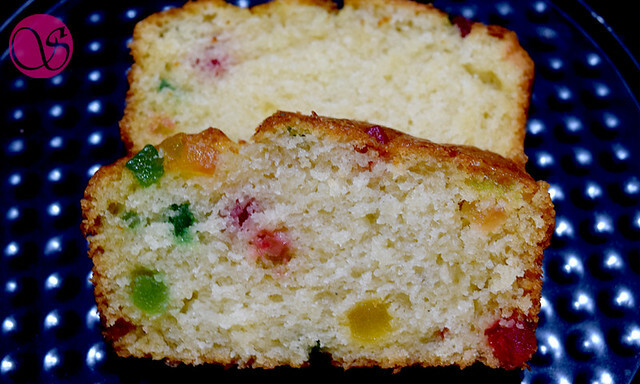 I used Semolina because it gives some nutty flavour and makes the cake little lighter. Dear Pragadeesh, Please note that I have used cream accumulated from skimming the milk. I do not recommend using Amul fresh cream because I have not yet experimented with it. Thanks for updating this to me. This can help many other folks. Thanks again. Hi Tarun, I am assuming you wanted to say Malai instead of Makai. In my recipe, I have clearly mentioned that the Malai is accumulated from milk. You don’t really get such Malai in any country. You will have to accumulate this yourslef. I get fresh cream for whipping.Can I use that ?after whipping or without ? Also can this cake be used to make layer cake ?want to try this recipe to make a frosted cake . I will not suggest using Tetra pack cream for this cake. I have not experimented myself and hence cannot suggest. My recommended cream is the one that we accumulate from the milk. Further, I do not recommend this cake for layering purposes. 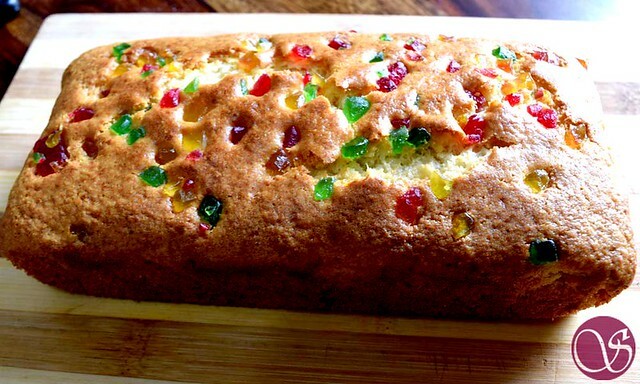 The cake is too moist and when you will cut it, it will break and wont be stable for you to layer and frost it. Hi. I want to try out this cake today. Can u use store bought amul fresh cream ? Hello Smitha, Amul fresh cream will not work for this recipe. You need to accumulate fresh cream from the milk. Thanks for your feedback. Appreciate. I haven’t experimented with Wholewheat flour so it’s difficult for me to suggest but if you want to experiment then i can only suggest to Increase the liquid content accordingly. Hi. Just baked the cake. But it has sunk in the middle and the tutti frutti placed on top too has disappeared into the batter.? -because of uneven temperature of oven. -Baking soda/baking powder was not good. Amazing !!! Really nostalgic !!! What did u use fresh Malai or fresh cream that we get in market? N can u pls share ur coffee n dates cake recipie as my daughter did not take dates;so can give her in this form. I have used Fresh Malai accumulated from double toned milk, not the market cream. Share the results when you try the recipes. May I use the tetra pack cream..to get fresh cream is tough. The results cannot be achieved using tetra pack cream. I understand when you say getting fresh cream is tough, however there is no alternate to fresh cream. No tetra pack cream please. The results can only be achieved by accumulating fresh cream from milk. Milk powder will not help you get Malai. As an alternate, instead of 1 cup of malai, use 1/2 cup of cream and use just 2 tbs of oil. Rest of the ingredients and process shall remain same. Hello. How big the pan should be? Is it 6″ or 8″? I have used a pan of 8*4*2.